Oh well, it’s Nitta Youka! let’s try it out. And so I went and bought Kiss Ariki chapter one. Honestly, the chapter itself was pretty nice, two yakuza’s sons get secluded in a solitary island in order to protect themselves from an upcoming underworld war. Tohru has a very though personality and isn’t really happy about having to spend so much time alone with Mutsumi when he could be helping his father. Mutsumi on the other hand is a very smart man that doesn’t want to get involved in the yakuza world, but he seems to be oddly interested in Tohru. Not exactly an impressive plot, but I quite enjoy the art-style and this mangaka is creating some interesting characters again. Now onto my reason to be in rage. First thing I noticed when I opened Kiss Ariki on the PC Kindle was that I couldn’t quite read the letters without pasting my face to the screen. That was fine until I realized that there was no zoom option for images and that’s when I regretted my purchase. I could barely read it, and it’s not like I have a tiny screen. Am I missing something here? Is there a zooming feature for the PC Kindle that I’m not aware of? I could read...with some extra effort. It’s easy to blame the software for the lack of this feature, so important for reading manga, but I don’t think that’s all there is to it. It’s my first time using this format but I’m pretty sure that white area is intended as the available space for the book page. As you can see, it’s not properly used. Is it just me or the image quality is really poor, my thinking is that Animate U.S.A didn’t provide good material to the Kindle edition. Is it that difficult to create an HQ scan of a manga? Seriously, for that price, at least I hoped to enjoy the experience and certainly I didn’t. I am very interested in reading more of this story, but I guess I won’t be able to until Animate U.S.A is provides good images for the digital version. Have any of you tried another Kindle titles from Animate U.S.A or other companies? How did it turn out? Edit: someone told me at Amazon that there are no problems with the Kindle device; that one and the iPad seem to have a zoom in feature. 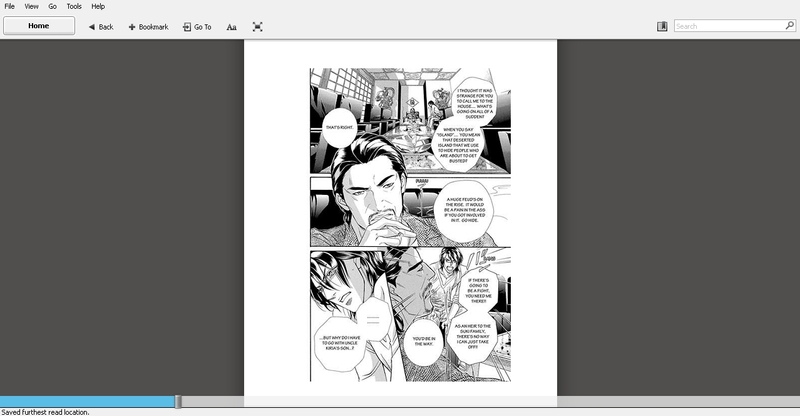 I just wish Kindle PC improves in this area, making manga reading a good experience. This entry was posted in Manga and tagged Animate USA, Boys Love, Nitta Youka. Bookmark the permalink. Gah, I instinctively leaned forward and squinted to look at that screenshot. I really hope it’s just a software issue or something they intend to fix. Soon. For that price, you should get a higher quality picture. If you know some spanish there’s a spanish scanlation group that has already scanlated the whole volume 1 and it’s quite good quality scans. It will take a while for them to scanlate the second volume though, since they do it from tankōbon and not from magazine chapters. Sensei’s art is so beautiful that I could stare at it all day long!